Tyne's cot has always been a space that I kept free of anything other than his cot sheet and his gro bag. But now that he's turned one, I've started to allow him to take some cuddly friends to bed with him and I have to admit - I'm finding the whole thing very cute! His latest little bedtime buddies are these super cute little guys from Lamaze. The Cuddle Up Koala is my own personal favourite as it's a Mummy Koala with a little pouch holding her baby Koala - how sweet?! The Baby Koala is a squeaker toy which has a leaf teether for Tyne to chew on, and the Mummy has lots of textured parts to Crinkle and play with. Although the Koala are my favourites and Tyne does enjoy them, his favourite seems to be the Purring Percy Cat. Purring Percival is very brightly coloured and holds a little ring with beads and ribbons that Tyne loves to fiddle around with - the purring sound is very realistic too! The toy isn't battery operated, it just contains a sound box that - when turned side to side - makes a purring sound with a little vibration too. Torin the T Rex is another firm favourite of Tyne's and also features lovely scrunchy bits & teething rings - Torin is attached to Tyne's pram and keeps him company on outings, which he loves. 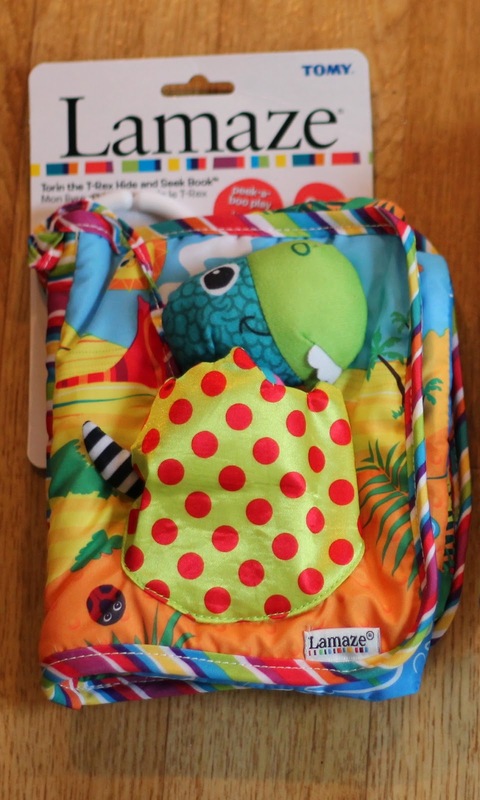 Lamaze also produce fun fabric books featuring their characters - such as this one feauturing Torin - Tyne LOVES flipping through book but tends to accidentally tear the pages a lot at the moment so fabric books like this are perfect for his age! Just as we've found with every other Lamaze toy we've tried (And we have a LOT of them! ), these are gorgeous, eye catching and provide endless fun for Tyne. I can't recommend Lamaze highly enough. Lamaze have teamed up with Babyworld to offer you the chance to create a story about these or other loveable Lamaze characters - the winner will have their story made into a book! And there are lots of other fab goodies up for grabs too! To view more from the Lamaze range, please click here. Does your little one have a favourite bedtime buddy? We love Lamaze here too! My smallest is nearly two, but she has a squeaky wrinkly dolly with gummy teethers attached that she cannot part with! I think they're excellent, so well made and really eye catching. I've always fancied their mermaid for her...one day!! I don't think I have anything from Lamaze for Ethan yet. These look lovely.